The UKWCKFA has only two compulsory gradings. These were instigated to separate beginners, intermediates and advanced level classes. After that all gradings are voluntary and you will complete the rest of the formal ‘Art’ in time regardless of whether or not you wish to test yourself. 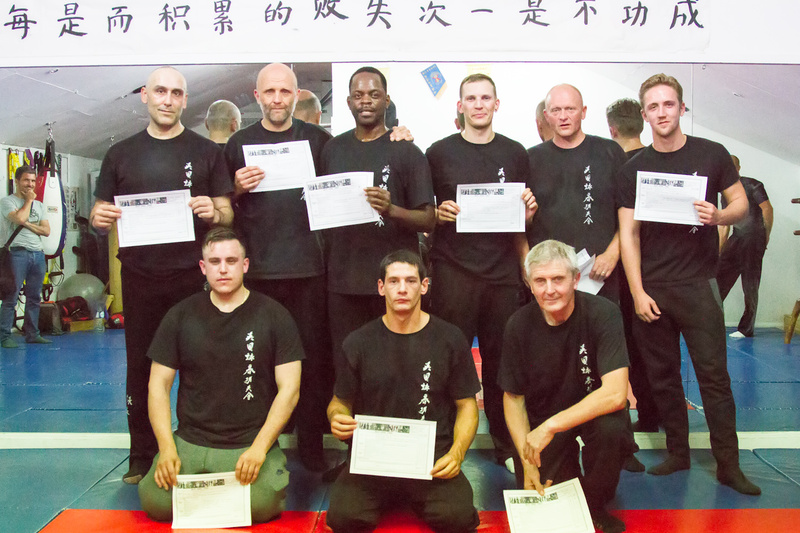 The UKWCKFA has only two compulsory gradings to move through classes. The Siu Nim Tao grading allows students to move to the advanced classes. Big ‘Congratulations’ to all of the students who took part in the 2nd Level grading known as the Siu Nim Tao grading. There was a great class camaraderie. The students who came to watch were inspired to push forward and enjoyed it immensely. Another ‘Well done’ to Darren Sumpton of the Maidstone Wing Chun School as he succeeded in gaining a ‘Distinction Pass’ of 82.5% well earned and a testament to his teacher Mark Blackbourne. Special thanks go out Advanced Level students Kyriakos Charalambous and Chris Kelly who went in and trained with the guys last night to push them and help them reach their potential.